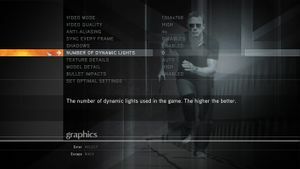 Frame rate is capped at 30 FPS; use Quantum of Solace FOV and FPS unlocker. 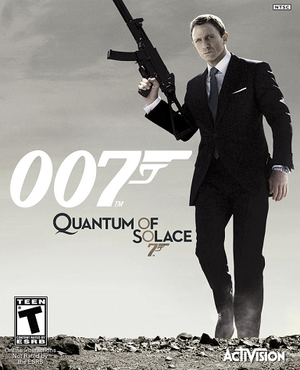 The game is no longer available digitally, most likely due to Activision losing rights to James Bond license. The 1.1 Patch updates the game to the latest version. The game should automatically prompt for the update when using a LIVE profile; the update can also be downloaded manually (extract the contents and run QoS_Update.exe). Config file is encrypted and contains save data. Default FOV is 65° (horizontal). Use SuicideMachine's Tool to modify it. Use SuicideMachine's Tool. After launching the game press Alt+Tab ↹ for the changes to apply. 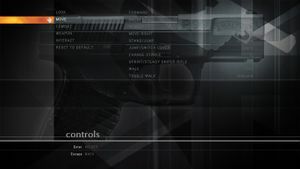 Capped at 30 FPS; use Quantum of Solace FOV and FPS unlocker to modify the cap. High framerate may occasionally cause some issues. See developer notes. 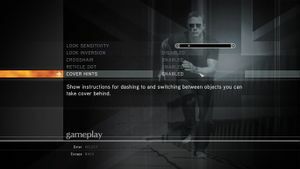 Use Quantum of Solace FOV and FPS unlocker to modify the cap. High framerate may occasionally cause some issues. See developer notes. 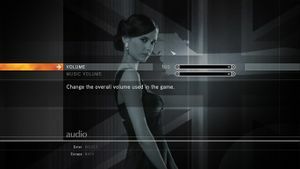 Using an online GFWL or Xbox profile will cause the game to freeze after the 2nd mission's initial loading cutscene (Siena). Using a local GFWL profile resolves this, however you will not be able to unlock achievements nor access the save from your online profile. Click here for instructions on creating a local profile. Use the Ambient Occlusion flag 0x00000004 with Quality or High Quality. Under Profiles type Quantum of Solace. Under Ambient Occlusion compatibility insert the flag 0x00000004. ↑ 3.0 3.1 File/folder structure within this directory reflects the path(s) listed for Windows and/or Steam game data (use Wine regedit to access Windows registry paths). Games with Steam Cloud support may store data in ~/.steam/steam/userdata/<user-id>/10080/ in addition to or instead of this directory. The app ID (10080) may differ in some cases. Treat backslashes as forward slashes. See the glossary page for details. This page was last edited on 1 April 2019, at 04:12.